Fa la la la la la la la….2 days and counting till the big man himself arrives! Mini-me is soooo excited! Every time he sees Santa, we have to stop. This year I did something I have never even considered doing before. I had a white and blue Christmas theme. In years past it has always been red and gold. But this year it was time for a change. It was fun finding all things white, blue and silver. I loved putting the tree together. But there was one thing missing. A skirt. So, I made one. Ever made a Christmas tree skirt? It is super fast and easy! I used velveteen in a baby blue color. I took a piece I already had on hand (it is a frugal Christmas this year) folded it in half and half again. Unfold the circle and cut from one edge to the center of the circle. Sew a hem along the cut you just made (this is the part you slide around the trunk of the Christmas tree). For the gathered edge, cut strips of fleece about one foot wide and sew the lengths together to equal approximately 2 1/2 times the circumference of the circle. Sew the fleece to the edge of the velveteen circle with “right sides” together starting at the hemmed edge of the velveteen. As you sew gather the fleece slightly but keep the velveteen flat. This will create a gathered edge to your skirt. If you prefer, you can accomplish this by baste stitching one edge of the fleece and gently pulling these threads as you sew the basted edge to the velveteen (this method creates the gathers for you). When you reach the end, simply pull the remainder of the basted thread out of the fabric. Since I like everything to have a finished edge, I used a serger once I had the gathers in place. This is not necessary. At the edge of the skirt (where the tree fits around the trunk) place a piece of Velcro on each side. You will use this to keep the skirt in place under the tree. Again, not necessary, but if you have little ones in the house it helps to prevent the skirt from being pulled away. I placed plastic grocery sacks underneath my skirt to make it look fuller. It looks like a pillow under my tree! I love it. I also have a tutorial here on how to make those gorgeous ribbon bows you see on the tree. They are especially great when you have a little one who likes to play with ornaments (they don’t break). I love a blue and white tree! I never can decide if I want to do a theme tree or not. yours is so pretty. I love to hear from you. Please leave me a message and I will strive to reply. Hi, My name is Kimberly. I am an American living in Australia. I love to decorate, create, and explore the world around me. Please join me as I learn about the differences and similarities between the two countries I belong to. If you see something you like; click on the photo. 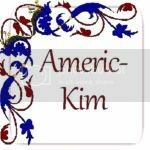 Or you can go directly to my shop by clicking on "AmericKim". Happy Shopping! copyright 2014 by AmericKim Home, all rights reserved. Powered by Blogger.